After hours of hard work and frustration, you have finally gotten your character looking perfect with the right clothing and poses. But wait a minute, you just completed your render only to find that your character is floating in space! What you need now is the perfect environment suited for your character's style. You could make your own environment from scratch but that would just be crazy. This guide will show you how to use the free items included with DAZ Studio to get you started creating your own environments. It will also cover many of the popular environment sets with demonstrations that include products created by some of 3D's top artists including LaurieS, Moyra, Flipmode, Stonemason, Ajax, and Moebius87. Grab a copy of this tutorial to take you step-by-step from no surroundings for your characters to the creating a wide variety of natural and city environments in no time. 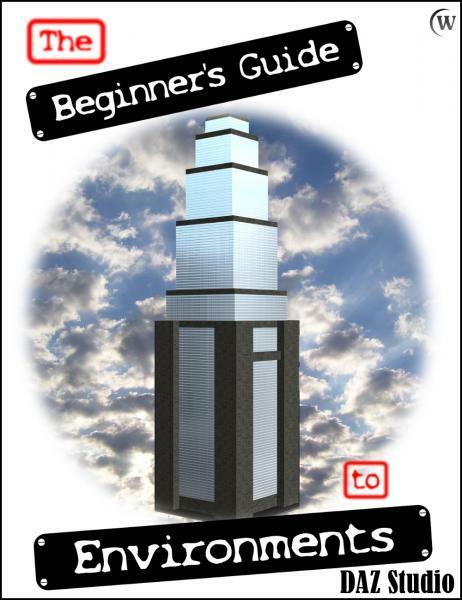 This guide is fully illustrated in PDF format covering terms and techniques you need to know to start creating your own environments for rendered scenes.